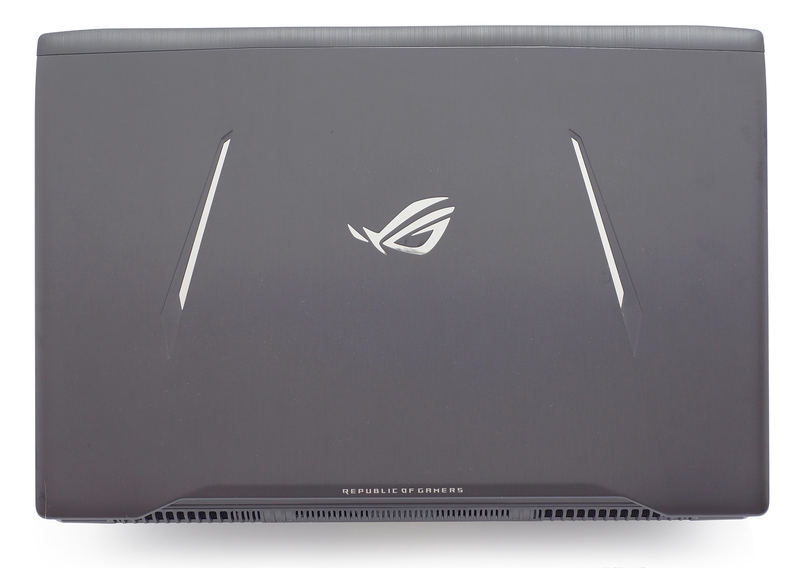 LaptopMedia.comReviewsASUS ROG Strix GL702ZC (AMD Ryzen 7 1700, Radeon RX 580) review - a really good workstation with ROG's branding on top? It’s been a while since AMD released anything exciting for the notebook market so we are excited to see how their top-tier desktop-grade CPU performs in a standard gaming laptop and paired with the Radeon RX 580. We are also pretty curious how the normal-sized 17-inch chassis will handle all that horsepower and does the RX 580 stand a chance against the alternative GTX 1060 configurations. 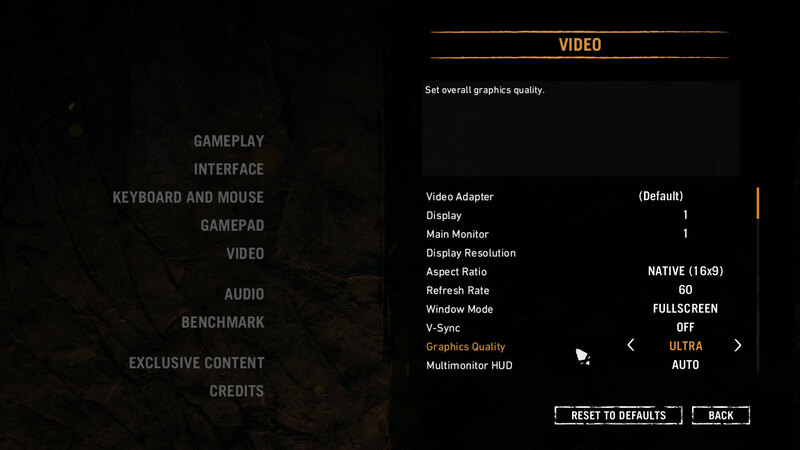 Why the GTX 1060 you ask? Well, since the ROG GL702ZC costs just about what a standard Intel Core i7 + GTX 1060 configuration would, we think this is exactly the GPU it should beat in this price range. However, we have to take the Ryzen 7 1700 CPU into consideration – this is one of the few desktop-grade processors integrated into a notebook and it’s fully replaceable as well. This is a huge deal to consider and would most probably crush Intel’s high-end quad-core Core i7-7700HQ and Core i7-7820HK chips in multi-threaded workloads since it has twice the cores and twice the threads of Intel’s solutions. But at what cost? Will the 65W TDP of the Ryzen 7 1700 cause any overheating issues or performance dips? We find out in the full review below. 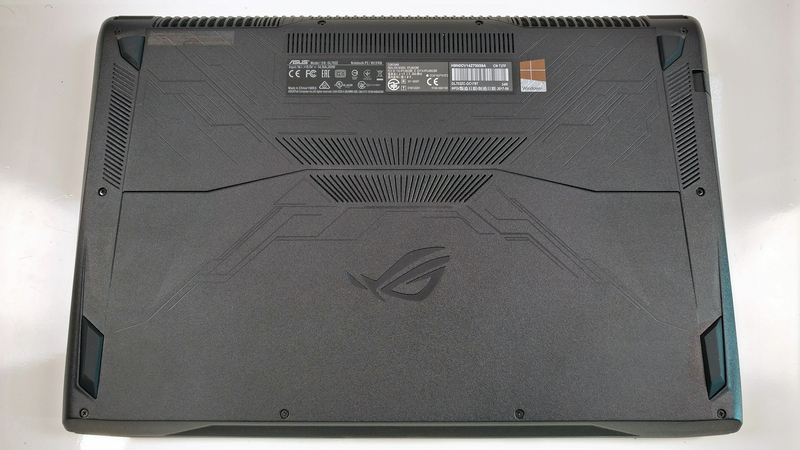 The notebook comes in a cool-looking ROG Strix-branded box containing all the usual user manuals, AC adapter and power cord. 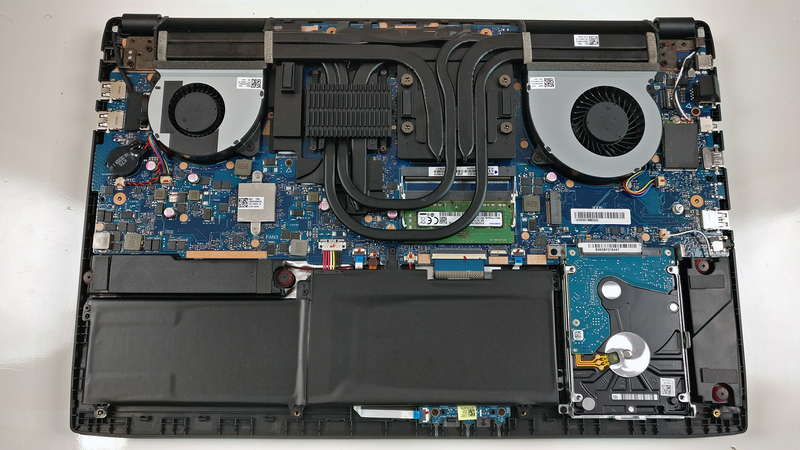 As you might have already guessed it, in terms of design the laptop is almost identical to the standard Intel + NVIDIA configuration we’ve reviewed a while back. We have some mixed feelings about this because, given the price point, the GL702 chassis should include more premium and sturdy materials instead of using plastic for most of it, yet we find the chassis surprisingly portable given the fact that it’s a 17-inch gaming laptop with a desktop-grade processor stuck inside. The I/O is generous and well-distributed and the keyboard feels nice for typing but not quite for gaming. 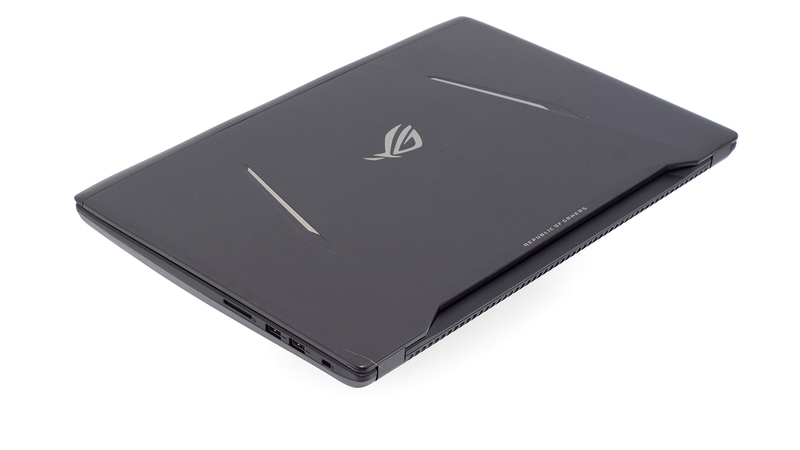 And just like its more expensive sibling with the GTX 1070, the GL702ZC has a brushed aluminum lid, which is fairly resistant to torsion and pressure and now has chrome-colored plastic ROG logo in the middle and a stripe on each side. This makes the notebook a bit more clean in our opinion. Funny thing about the hinges, though, there’s plenty of spacing between them so the bottom chin of the display is a bit more flexible as a result but provide a firm grip over the display. You can easily open the laptop with just one hand but just as you are about to fully open the device, the hinges start to feel a bit stiffer – this ensures zero wobbling when working on an unstable surface. The bottom of the base is made of the same slightly roughened black plastic as the standard GL702..
As we go around the sides, we can feel a slight increase in thickness over the GL702VS. And the specs sheet further confirm that – the standard GL702 version measures at 30 mm while this one is 34 mm thicker. It might not seem a lot but you can definitely feel it. The I/O selection is well-distributed and rich – on the left you will find an RJ-45 LAN port, mini DisplayPort, HDMI, USB-C 3.1 (Gen 2), USB 3.0 and a 3.5 mm audio jack. On the right, you will see the SD card reader along with two more USB 3.0 connectors. So far so good but our main complaint comes from the interior. The surface is again made of plastic and imitates brushed aluminum but doesn’t even get close. We can feel a few weak spots around the center of the keyboard and the palm rest area – once you apply a bit more pressure, it sinks in quite visibly. A more stable base would have been better, especially for the asking price. Moving on to the keyboard – it has satisfying clicky feedback, big enough arrow keys and all the needed shortcuts – ideal for typing. Nevertheless, we find the rather short key travel to be an issue here, particularly for gaming. Long travel keys are much appreciated by the gaming community and we find it funny how the considerably less expensive ASUS ROG Strix GL752VE has a better gaming-centric keyboard than the GL702-series. And as for the touchpad – it feels buttery-smooth, it offers light mouse clicks although, a bit sluggish at times and wobbly – something we are used to with most of the ASUS laptops anyway. We also find it a bit small for the 17-inch form factor but this is a gaming laptop on top of everything else so we can’t get too picky. Similarly to most of the GL notebooks, this one doesn’t have a service lid as well but it’s pretty easy for maintenance and upgrade. The piece can be removed by unscrewing all the bolts on the bottom. Then gently pry it up – it’s really straightforward. As expected, the notebook comes with a standard 2.5-inch drive and an M.2 SSD slot. 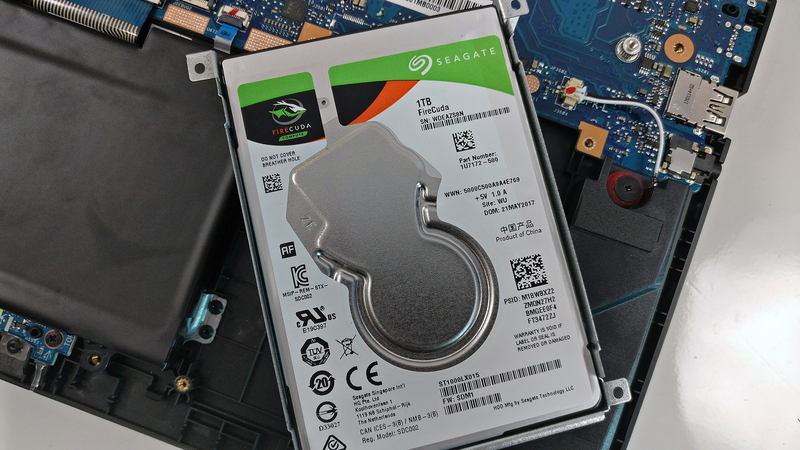 The former is taken by a Seagate Firecude 1TB HDD while the M.2 slot that supports PCIe NVMe SSDs remains available for an upgrade. It’s located right above the HDD and allows 2280 sticks. 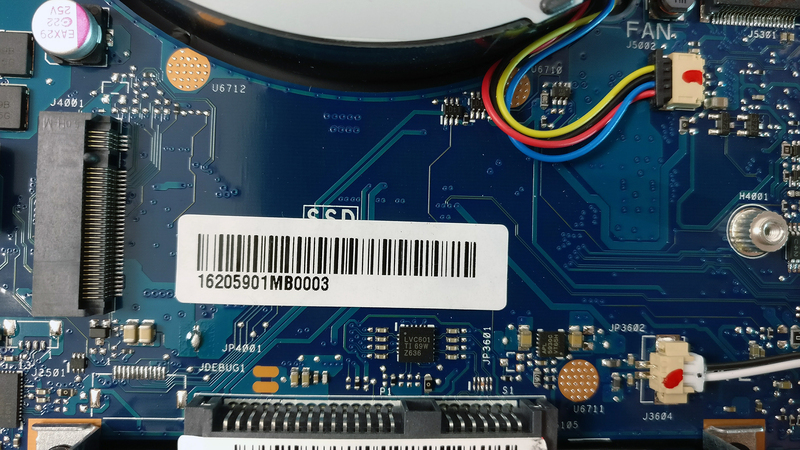 The RAM chips are a bit tricky to access since they are stuck under the heatpipes but someone with small fingers shouldn’t have any trouble with it. The slots support up to 16GB of DDR4-2400 each. 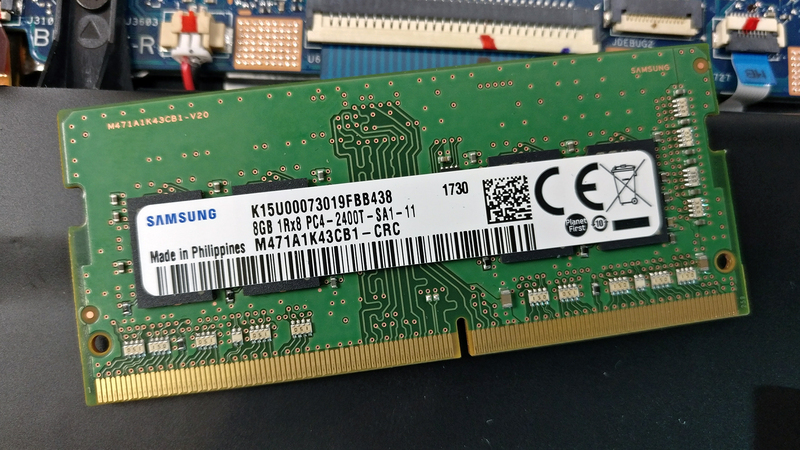 The unit we’ve tested came only with 8GB of DDR4-2400 memory from Samsung. 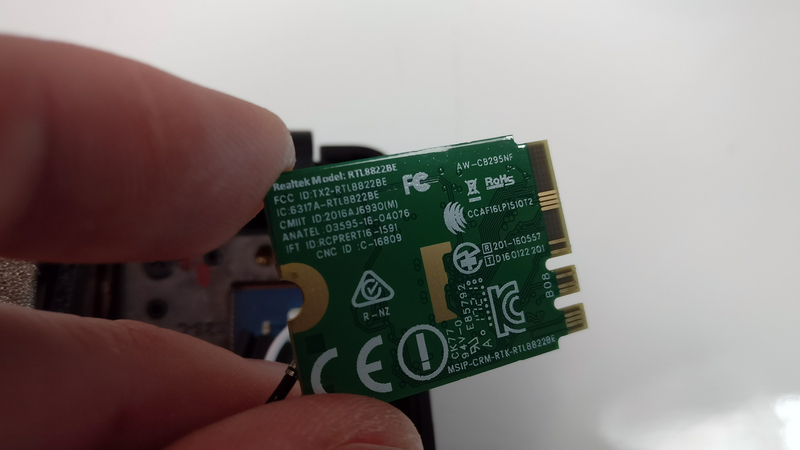 The Wi-Fi card is placed near the right cooling fan (with the bottom of the machine facing upwards) and it’s Realtek RTL8822BE. 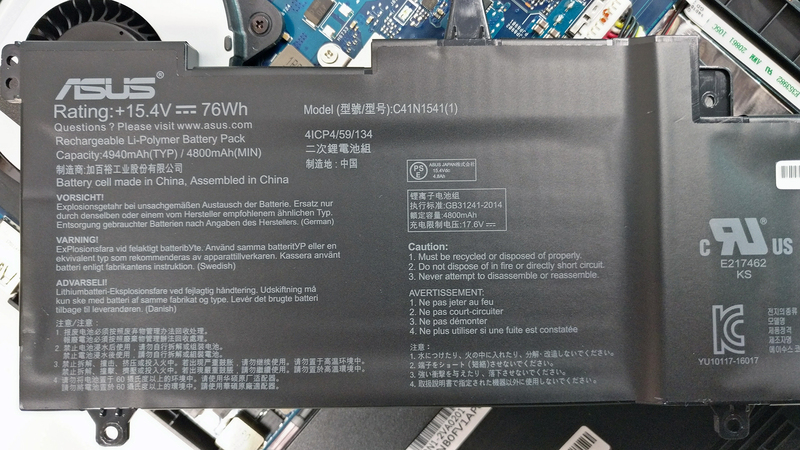 The laptop carries a generous battery holding a 76Wh charge. 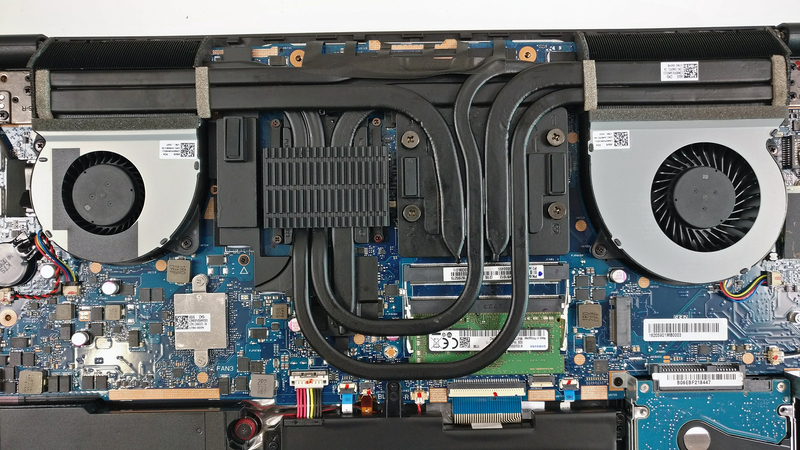 The cooling design is quite interesting and we haven’t seen so many heatpipes used only for the CPU itself. As you can see, the heatsinks for both chips are pretty big while the large number of heatpipes take away the heat. Also, the left cooling fan is slightly smaller than the one on the right. To our big surprise, the laptop comes with the same panel as the Acer Aspire 5 (A517-51G), the ASUS ROG GL703VM and Lenovo’s top-tier Legion Y920. It’s LG-made with model number LP173WF4-SPF5 – Full HD (1920×1080) IPS with 127 ppi and 0.1995 x 0.1995 mm pixel pitch. It can be considered as “Retina” when viewed from at least 69 cm. The maximum recorded brightness is 391 cd/m2 in the center and 378 cd/m2 as average across the surface with just 10% deviation. 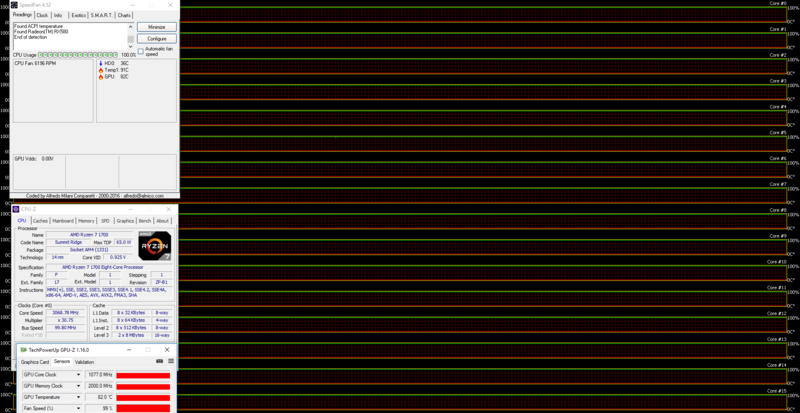 The correlated color temperature on white screen at maximum luminance is close to the optimal – 6780K and as we go along the grayscale it gets closer at 6640K. 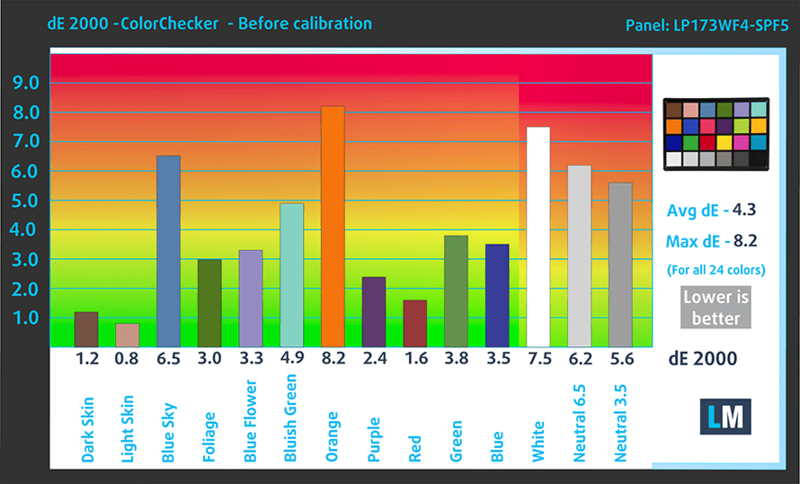 You can see how these values change at 143 cd/m2 (48% brightness) in the image below. 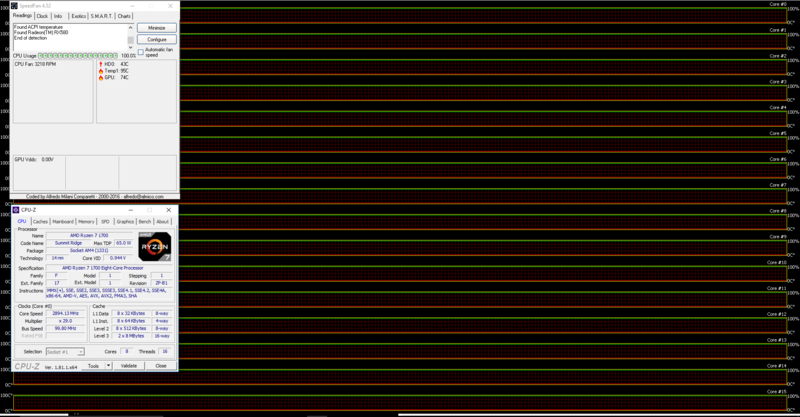 The relative dE2000 (color deviation) shouldn’t be more than 4.0 if you are planning on using the screen for color-sensitive work but in this case, it’s going to be used for gaming and it’s even under the 2.0 mark. Contrast ratio is good a well – 1070:1 (1060:1 after calibration). The sRGB color gamut coverage is ideal for multimedia and gaming, as expected – 89%. Our verdict on the panel has not changed over time and we still think it’s an excellent solution for multimedia/gaming-centric laptops. It has all the needed properties – high peak brightness, wide sRGB coverage, high contrast and has virtually no PWM making it safe to use for long periods of time. Sound quality is good – the low, mid and high frequencies appear to be clear and without noticeable distortions. 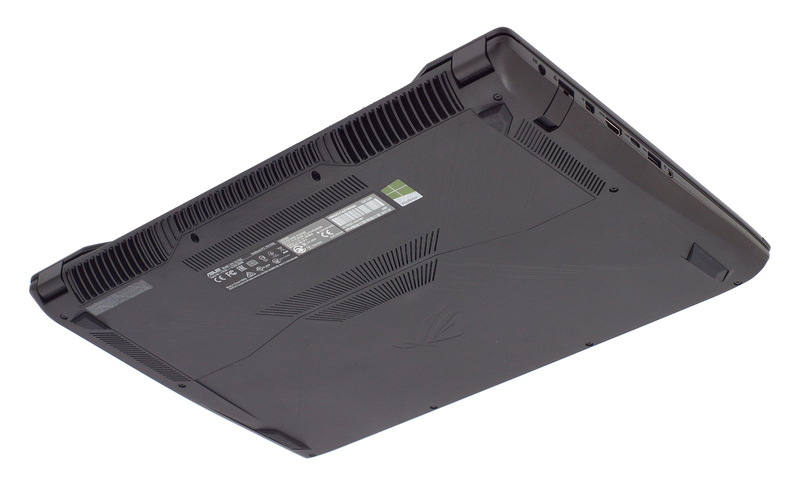 As to be expected from a notebook carrying a full-fledged desktop processor, battery life is extremely short. Even though the device sports a 76Wh unit, the 65W processor drains it really fast. Anyway, all tests were run under the usual conditions – Wi-Fi turned on, screen brighntess set to 120 cd/m2 and Windows power saving mode turned on. Extremely short web browsing runtime – 76 minutes (1 hour and 16 minutes). Just about the same as the video playback score – 78 minutes (1 hour and 18 minutes). Of course, the laptop isn’t made for gaming away from the power source but it can get you less than half an hour of runtime – 22 minutes. The AMD Ryzen 7 1700 is a high-end desktop-grade CPU but due to its relatively low TDP of 65W and decent thermals, it has been implemented in gaming notebooks as well. The chip is based on AMD’s new Zen architecture utilizing the 14nm node. It features a whopping 8 cores with 16 threads. Base clock speeds start at 3.0 GHz and can go up to 3.7 GHz (3.75 GHz with XFR feature (Extended Frequency Range)) with two or three active cores. But if all eight cores are utilized, the maximum Turbo Clock speed is specified as 3.2 GHz. The processor is rated at 65W including the memory controller, which supports either 64GB of memory clocked at 1833 MHz or 32GB of DDR4-2400 or 2660 memory. Fritz is a chess benchmark that tests the computing capabilities of the CPU with various chess moves. The AMD Ryzen 7 1700 scored 12.664 million moves per second. In comparison, one of the most powerful chess computers, Deep(er) Blue, was able to squeeze out 200 million moves per second. In 1997 Deep(er) Blue even beat the famous Garry Kasparov with 3.5 to 2.5. The stress tests that we perform don’t represent real-life usage because even games don’t require 100% CPU and GPU load for such long periods of time. However, the torture tests remain as the most reliable way to see how the cooling system performs and how effective it is in the long run. We started off with 100% CPU load and the results were striking. The system was able to utilize the full performance of all 8 cores (3.2 GHz) for most of the time but was occasionally dipping down to 2.9 GHz. The operating temperature was pretty high – 95 °C. Turning on the GPU stress test resulted in slightly lower CPU clocks but no throttling. The Ryzen 7 1700 ran at around 3.0 GHz most of the time while the Radeon RX 580 GPU was clocked at rock-solid 1077 MHz, which is the maximum and operating frequency anyway. Unfortunately, though, both chips were running pretty hot – 91 °C for the CPU and 82 °C for the GPU at the expense of extremely loud cooling fans. Seriously, we can’t stress this enough – the GL702ZC is probably one of the loudest – if not the loudest – laptop we’ve tested. They spin quite loudly not only during heavy workload but during gaming as well. In fact, you can feel the whole chassis vibrate when the fans spin at maximum RPM. The surface temperatures, as you can see from the heat map below, aren’t flattering as well. There’s noticeable heat dispersion across center of the keyboard and right above it reaching as high as 53.7 °C. It gets a little bit uncomfortable during gaming if you start using this particular area of the keyboard. First of all, such powerful desktop-grade processor like the Ryzen 7 1700 is downright an overkill for gaming. As we all know, games don’t require so many cores (at least for now) and they benefit most from clock speeds. 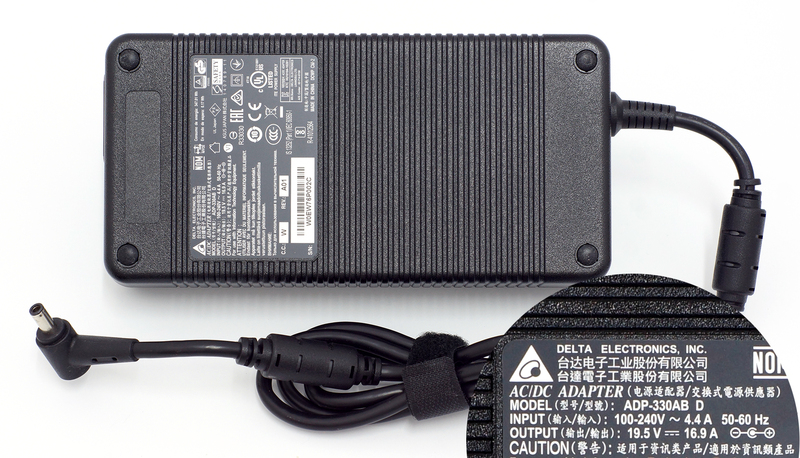 A 65W beast like this one doesn’t necessarily translate into more in-game FPS. It will, however, render like an animal serving as an excellent mobile workstation for content creators. Secondly, the AMD Radeon RX 580 is a great GPU but given the price tag of the laptop, you’d be better off with a GTX 1060-powered machine for sure. The RX 580 just can’t keep up with the GTX 1060 and serves as a bottleneck to the powerful Ryzen 7 1700. So in reality, a good old Intel Core i7-7700HQ will be more than enough for your gaming needs while the GTX 1060 GPU will be a much better choice for gaming in this price range. Moreover, the GL702ZC doesn’t really impress with anything else rather than screen quality although, FreeSync is missing from the specs sheet. The excellent IPS panel will deliver good multimedia and gaming experience while the obnoxiously loud cooling system will ruin it for some (it even runs when idle). Not only that but during heavy workloads, the interior gets a little bit too warm for our standards and all that copper used for the heatpipes and heatsinks inside has reflected on the size and weight. In addition, battery life suffers due to the 65W processor and the lack of integrated graphics. The touchpad design continues to plague the GL-series as well as the plastic base that feels a bit cheap compared to some alternatives on the market. So, if compute power is essential for you and you plan to do some content creative work on the ASUS ROG Strix GL702ZC, you will most likely be amazed by the utterly ridiculous multi-core performance the Ryzen 7 1700 delivers. But if you plan on using the machine mainly for gaming, we suggest looking elsewhere. Why not start with the recently reviewed ASUS ROG Strix GL703VM (with GTX 1060), the Lenovo Legion Y720 or the HP Omen 17 (2017) with GTX 1060. The Acer Predator Helios 300 (17-inch) is also a nice option to consider without breaking the bank. Excellent points Charlie. This system definitely is excellent for content creators with such a powerful CPU and AMD GPU’s computational advantages. I get the feeling that the author’s review doesn’t look into this laptop’s target audience enough and tries to lump this laptop in with the gaming crowd which clearly this laptop is not aimed directly at. You’ve made excellent points that pick up the slack that was left behind by the original review. 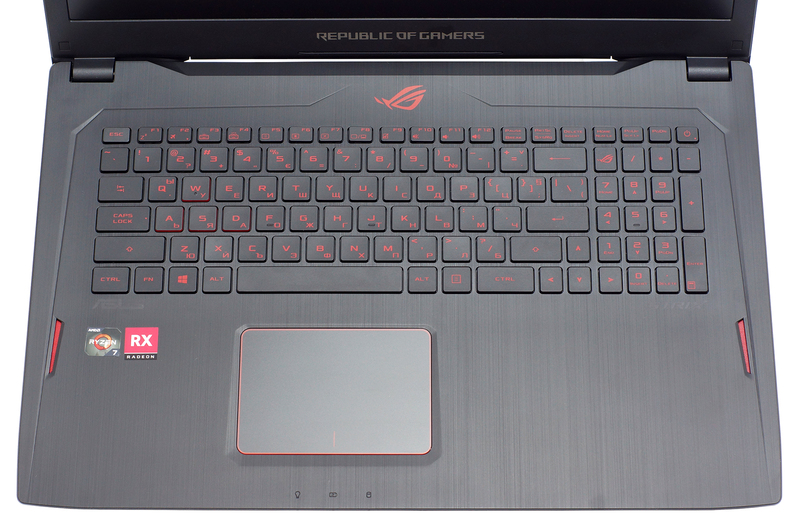 It’s a ROG laptop. 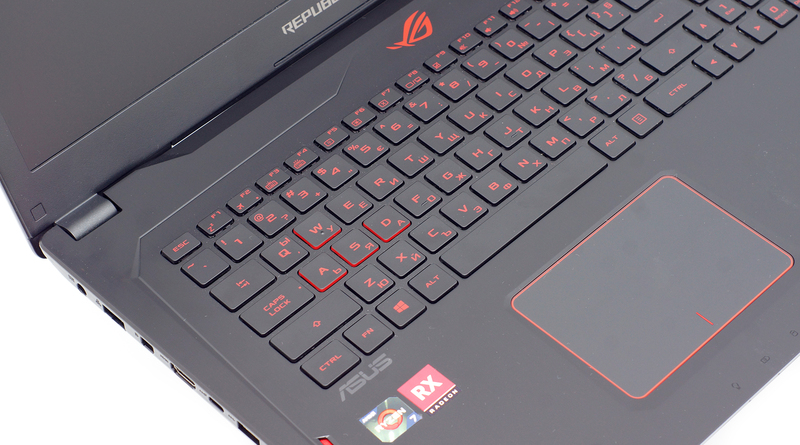 All ROG laptops are gaming-oriented which is why we’ve reviewed it as such. Which product page? I didn’t see anything on ASUS’ official website and our unit didn’t support it as well. It would be interesting to see if there are some units with the FreeSync support. It does support FreeSync indeed and there are two variations of the monitor, 60Hz and 120Hz although I couldn’t find which model version (code) is the 120Hz one. In my opinion this laptop is an excellent choice for 3D Rendering, due to the dreamy number of cores and threads…GPU is the best available option for this price range. Honestly, I did expect it to be much more expensive, considering the rendering value you can get for first time in a laptop, for me AMD just gave all 3D guys a reason to be very happy about it. I have the 60Hz variant and it does have Freesync support.